We know we’re heading to Thailand but, as you know, we don’t know anything after that. This makes it a little difficult to manage our time in a country that limits how long you can stay without a visa. For most holidayers it’s quite easy; most nationalities can arrive by air and enter the country for 30 days without a visa. Argentineans, Chileans, and Brazilians are able to stay 90 days without a visa. Some, though, can only stay 15 days and must apply for a visa when they arrive. The Thai Visa Wikipedia page outlines which countries fall into which category. For us this means we could arrive and stay for 30 days before having to do a border run in order to stay longer. But 30 days likely isn’t long enough and a border crossing entry only nets 14 more days. This would mean we’d have to head out of the country every two weeks in order to stay any length of time. Seeing as my plan is to settle in a bit and work on my new project (The Global Bookshelf) we were going to need to work on our plan. A little research showed that we could get a double entry Thailand visa that would let us stay in the country for two 60 day periods. I found all the rules and the application form for Thai Visas on the Canadian Thai Embassy website (American version here) and found that the closest consulate is in Vancouver. We could either attend the consulate in person with our applications or, alternately, mail them in to obtain a visa. As much as I would love to spend time in Vancouver the budget was the deciding factor so mailing it in was the solution. As the instructions on the websites indicate, all we did is send in the completed application, a passport photo, flight information, a money order for the application fee ($80 each for us), and a postage paid return addressed envelope. Easy-peasy. We sent the applications in right before Christmas and they were returned to us by New Years. Showing up at the consulate would have been even quicker. Can’t argue with that! Remember, this was my experience. I recommend you read all the visa information on the websites to determine what type of visa you’ll need and how to apply. 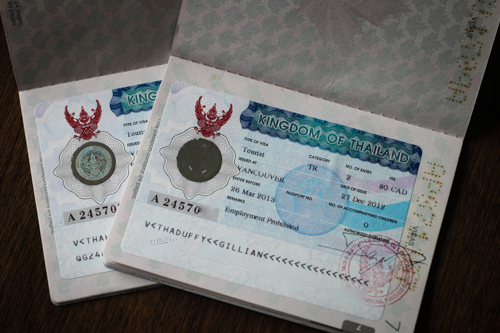 Thailand visa information has changed often with little notice in the last 5 years and continues to evolve. Always check with consulates and embassies rather than assume that other sources (including me!) are correct. I’m working on a new project! The Global Bookshelf will be a place for you to find books and stories that will connect you to the trip you’re already planning, or the one you are dreaming of. I would love it if you would sign up for updates; you can use the form right there in the sidebar. And thanks! The Global Bookshelf. Connecting travellers to a world of stories. I read the American version (thanks for providing that). Does the Canadian version require proof of round trip ticket or itinerary? For a visa run, do you just leave the country for a day and then come back? And do you have to pay the fees again? Sorry, as much as I want to believe I’ll just figure it out when I get there, I also feel like my mind is going in circles trying to understand this visa stuff. As for a visa run; yes, you need to leave the country but not even for a day. Just into the bordering country, pay the fees, get your stamp, and back you go. Staying over depends on how far the border is and whether you can do the round trip comfortably in a day. Don’t worry Carmel, these are good questions…no doubt if you have them others do too! Great information Gillian. I have a question I am applying for some visas and they all ask if I have insurance for the length of my stay. Was this an issue for you? I’m going to get travel insurance, but the length of my coverage will depend on if I get a visa or not. Did you have an issues with this? Stephen S. recently posted..A New Year in New York. Hmmm…I’ve never encountered this or heard of anyone else having this issue either Stephen. If they are just asking could you say that you intend on having insurance? Or are they asking for proof of insurance before issuing the visa? Try asking in the Lonely Planet or Boots’n All forums to see what others are doing. Let me know! This sounds great! Definitely good to know in case we ever decide to do something like this in the future. 120 days double entry sounds great. I’ve never been to Thailand, but as much as I’ve read from so many bloggers, a month doesn’t seem like long enough at all. On each of those 60 day entries, if you wish to extend it another 30 days, you can go to an immigration office within Thailand and pay 1800 baht. I know this because I and my friend got the same visa you did, and my friend would max out her stays by paying this fee. It’s definitely worth the effort to get a double entry visa if you’re planning on doing the expat/digital nomad thing! Thanks for pointing that out James. That is true and we may just do that. It’s a quick and relatively inexpensive way to extend. This is great info as we will be heading to Thailand soon and don’t know exactly how long we want to stay. Plus we’ll be entering by land so we only get 15 days, and I’m sure we will want to stay longer than that! Casi @HeyNoobz recently posted..The Weirdest Place In The Entire World Is In Singapore, And We Went There. OBVIOUSLY! Gillian, thanks for addressing this! My girlfriend and I are going to be leaving from the States in August and are just about to apply for our Visa’s. Ideally we would get double entry. On the application, how long did you put your length of stay? Also, it says on the Royal Thai Embassay site in the US that we need “4) A copy of round-trip ticket or itinerary. : Do you think that the round-trip ticket is a necessity? Keep in mind that we’re Canadian so our application process may differ slightly. We don’t remember putting a length of stay. The Canadian Thai Consulate also says we need a round trip ticket – we did not have one, nor were we asked to show one either now or in the past. If asked I would just state that we plan on leaving overland into Laos or Cambodia.